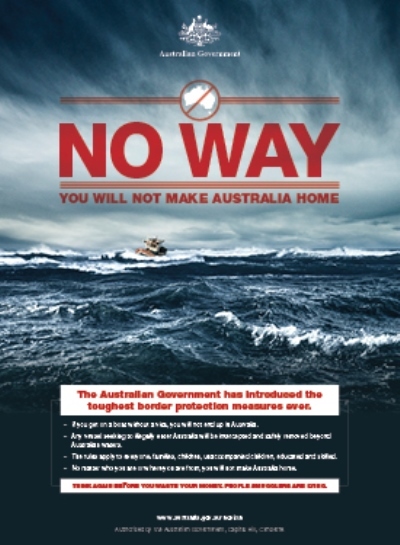 Subsidiary text notes, “If you get on a boat without a visa, you will not end up in Australia.” Aimed at Middle-Eastern migrants who cross the Indian Ocean to reach Australia, the posters represent a firm departure from political correctness and an acknowledgment that illegal migration has a direct effect on both sovereignty and national security. A record 300 refugee boats made their way to Australia in 2013. 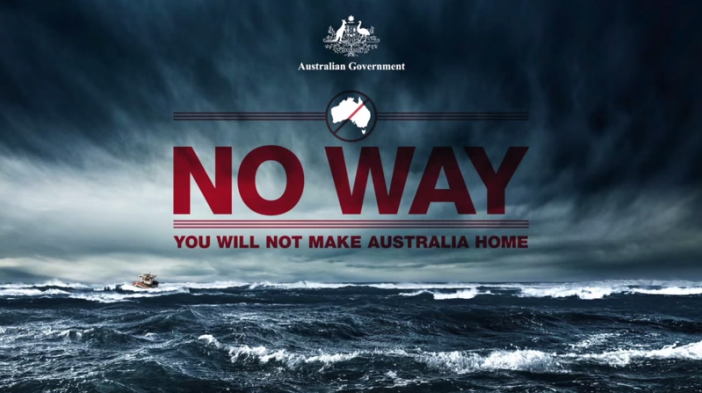 Since the launch of Operation Sovereign Borders, only one refugee boat has attempted to enter Australian waters and it was intercepted by Australian authorities. Operation Sovereign Borders was successful because Australia clearly articulated a pro-enforcement message and took decisive enforcement action, like towing seaworthy refugee boats back to international sea lanes, rather than permitting them to land in Australia. Although the Australian government has not released figures showing the cost of the Sovereign Borders media campaign, it certainly spent significantly less than the millions the U.S. expends annually on ineffective border enforcement. Should U.S. immigration authorities should borrow a page from the Australian playbook and launch a pro-enforcement media campaign directed at the southern border? The United States has previously attempted pro-enforcement media campaigns. But they were neither extensive, nor coupled with the type of decisive action to which Australia has committed. Instead, the U.S. has consistently combined lax enforcement with a clear message that there are few consequences for violating immigration laws. Rather than a rapid return to their nation of origin, illegal aliens who cross into the United States can find work and government-sponsored protection in sanctuary cities. And while the number of aliens entering Australia without authorization plummets, the number of illegal aliens entering the United States continues to climb. Oh the irony: Australia was founded as a penal colony, a place stash criminals. Yet they have long been a civil and law abiding bunch. The adherents of “the religion of peace” seem to be unable to match this capability and are understandably not welcomed in the former penal colony. Good for Australia!!! It sounds like the Aussies have good common sense! If an intruder(s) enters your home uninvited or not through the proper channels, most people would expect that person(s) to leave or be removed. The logic is no different with foreign intruders entering our country illegally. (The U.S.A. is our home.) Legal immigration only!! It is not fair of foreigners who have applied to become U.S. citizens and are going through the LEGAL PROCESS. ILLEGALS ARE CHEATERS. Stop rewarding cheaters!!!! Also, for all the proponents of open borders, what do Americans citizens get out of this? Are the countries of illegal immigrants allowing U.S. citizens the same right to enter, squat and get benefits? What about RECIPROCITY??? It seems very one sided to me. Americans are being taken advantage of. The United States needs to follow Australia’s example. As long as muslims run our country, from the White House to each Federal Agency, we will be swamped with muslims. Obama is a good friend of Islam and especially Iran. Hillary is almost as bad as Obama and she is a Muslim Brotherhood operative as one of her top advisors, Huma Abedin. We need to elect Trump who will slow muslim immigration into the USA. It’s be the imbecile in the White House, and his lemming Dem lowlifes that brown nose Soros and the despicable open border ilk that will be the ruin of this once great nation. I remember watching a BBC news report a few years back where a relatively large ship with a lot of impoverished potential illegal aliens pulled into an Australian port, and the Australians sent Special Forces soldiers out to intercept the ship. I also had a neighbor who was transferred by his company to Australia for a while, and his wife went through the process of applying to a job in Australia. She later said that she had to go through a very extensive process with a lot of paperwork where she had to prove that without a doubt she would not be taking a job from any Australian citizen. I knew of a guy many years ago who wanted to move there and they told him if he didn’t have some specialized skill don’t even bother to apply. The dodo birds who run this country insist that every person with a tenth grade education and five kids is some big advantage for this country. Australia only has about 25 million people vs. our 320 million and they actually discuss the effect of immigration on population growth, which they don’t want. Here if you bring up the fact that immigration is making OUR population grow by over 30 million per decade everyone on the left goes ballistic with charges of racism and bigotry. California is out of water, the ground water has been drawn down so far that land is subsiding in a lot of areas, and yet the voters keep electing the mass immigration proponents like Brown and Pelosi. Talk about stuck on stupid. And California has billions of unfunded future pension liabilities because of the generous pensions promised state employees, yet many of these state employees with pensions destined to run out of money cheer when benefits are lavished on illegal immigrants. California is a good example of Churchill’s famous saying that democracy is the worst form of government, except for all the others. I always see claims that “red states” are most likely to have a bigger percentage of their population on welfare. Mississippi is always given as the example. But the fact is that Mississippi has the highest percentage of blacks of any state in the country at 37%. No surprise that there’s heavy welfare use. The five deep south states of Louisiana, Alabama, Georgia, South Carolina, and Mississippi have very high percentage of blacks, so I’m sure that is a bigger factor than being “red states”. Now we have AUSEXIT added simultaneously?….next EXIT from globalism= TRUMP!